Literature was one of my favourite subjects in high school and I remember writing many essays on The Great Gatsby and really enjoying studying the novel. A new film remake will come out this year and I must say I'm really looking forward to it and seeing how it compares to the 1974 version. It was a pretty cold day so as usual I layered a collared top underneath this fleece sweater and paired it with a velvet skirt (I have these in a few colours as I find them to be super warm and also the heavier material means that they don't tend to blow up in the wind). My hair's faded into this strange green colour as I've been too lazy to re-dye it because it's been so chilly (my excuse), coloured hair can seem like so much maintenance sometimes but I'm not too fussed about it to be honest, I'll get on it when I feel like it. 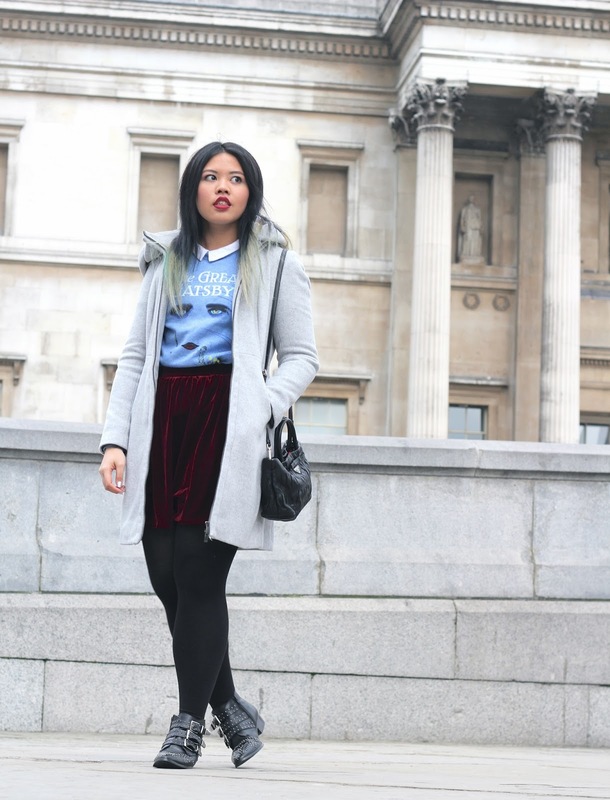 Adore your red velvet skirt. YOUR SHIRT!! i must have it!! I just read the book at school and am looking forward to the movie as well!! 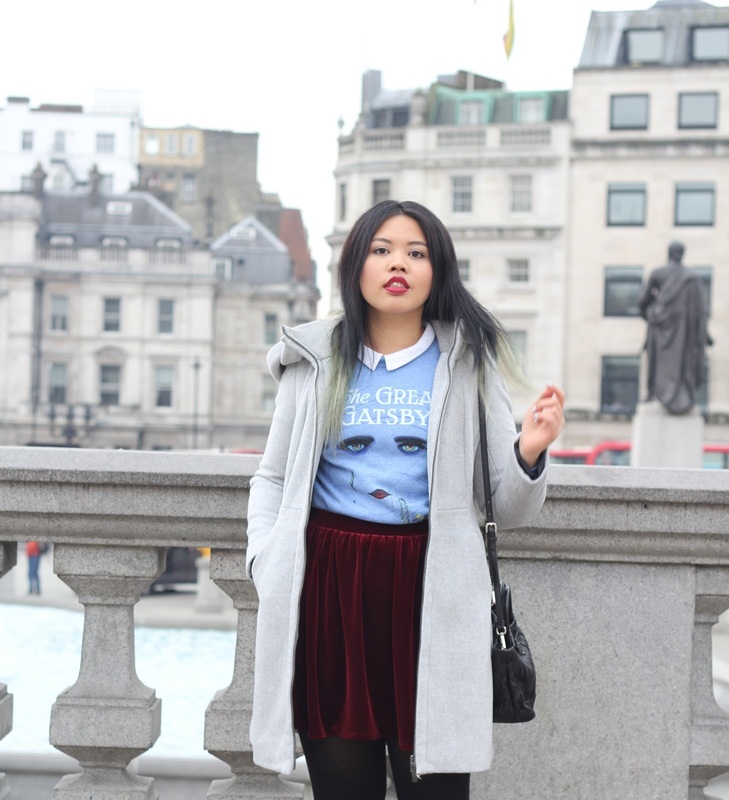 I want that gatsby top! awesome outift. i love the skirt and the jumper. you have such a great style. I really liked The Great Gatsby too and I love your sweater. Nice look! check out my blog if you like? I keep passing AA stores but I can't remember where I've seen them all, for sure there's one stand alone store on Oxford St, a section in Selfridges, and one in Westfield mall though. Haha I was so tempted to get a photo on the lion too but it was swarmed by kids. I'm really loving your outfit posts! Your sweater and skirt are amazing. Wow where did u get tat shirt? I read tat book in high school- Can't wait to see the movie wen it comes out!!! x A.
such gorgeous photos! I am SO excited for the new gatsby movie. it is one of my favorite books and I am a huge Leo fan :). I can't wait till the movie comes out... I loved the book when I read it in high school! Thanks for sharing your adorable outfit! Hello dear~! Absolutely loving the whole outfit but for some reason the skirt with that shirt looks incredibly well. Really enjoy your blog and how you moved to London to follow you dreams.